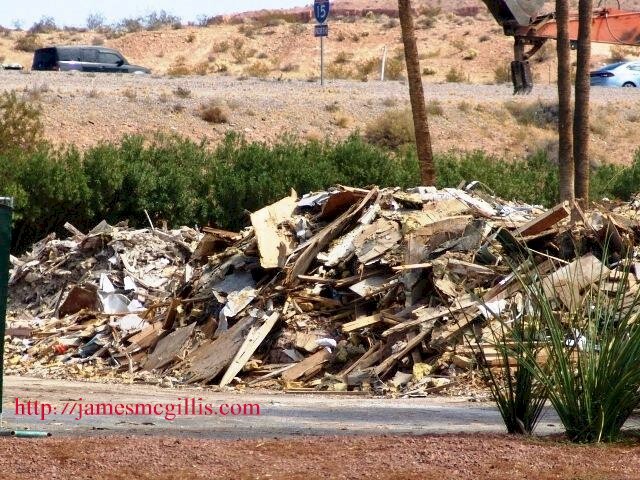 In 2009, I stopped in Mesquite, Nevada. While heading north out of town, I took photos of several old buildings and signs. A town’s architecture and graphics help reveal its history. A common theme involves a once flourishing business now closed. For example, when Interstate I-40 bypassed Seligman, Arizona, the attractions of Old-66 were barely enough to keep Old Seligman alive. With so little business activity generated after its bypass, Seligman froze in time. Therefore, many old buildings and signs in that town remained in situ. In 1974, after the completion of Interstate I-15 through Mesquite, most new development came in the form of condominiums. The targeted customers were retired people or second-home owners. Today in North Mesquite, large new retirement complexes tend to focus the eye on human made water features, including a series of water-wasting golf courses. With such environmentally wasteful practices in effect, little if any summer-season water flowing in the Virgin River reaches its outlet at Lake Mead. Prior to the construction of Mesquite's sprawling retirement communities, the same area represented only a small portion of a vast network of arroyos. Partially filled with wind-driven sand, the area was an "alluvial plain in the making". Most people do not think about “upstream” in the desert. Such terms matter only when a major flood hits such a dry area. When thunderstorms linger on nearby Mount Mormon, resulting floods carry enormous flows down those arroyos filled with sand. During, or shortly after an deluge upstream, watercourses shift, overwhelming their banks and inundating previously dry areas. In the case of the recent condominium development in North Mesquite, everything will probably be OK. However, if we live to see the thousand-year flood, let alone the ten thousand-year flood, all of that could change. If either of those events happens, the ancient erosion field and slide zone that is North Mesquite shall not stand. In terms of proximate risk to property owners, safety and security may depend on one’s sense of time. Mesquite, Nevada built its reputation on a firm foundation of gambling. Today, viewing it on Google Maps shows us that North Mesquite lies near the foot of a massive paleo flood zone. 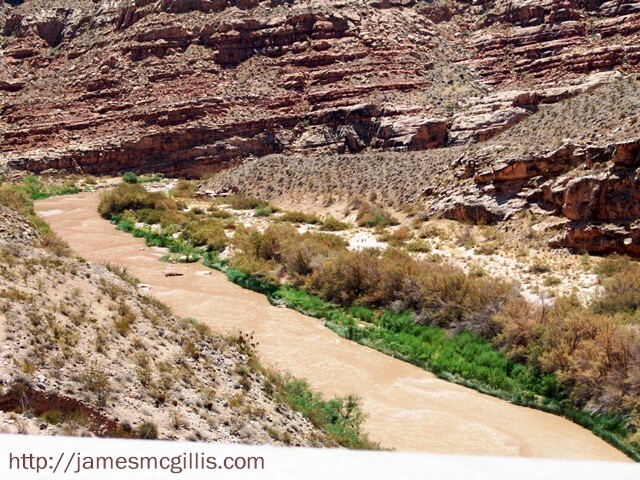 It does not take a trained geologist to see that ancient debris flows swept “downstream”, temporarily interrupting the Virgin River as it swept across the river and far up on the opposite bank. These desert sands appear to be the terminal deposition of ancient North Mesquite debris flows. It is there, on the east bank that buff colored desert sand intermingles with the dark, volcanic alluvium descending from Virgin Peak and Mount Bangs. Today, such a flood would have to cross Interstate I-15 and West Mesquite Blvd., inundating most of Old Mesquite. In that scenario, all of Mesquite would remain in peril. The good news is that the ten thousand-year flood only comes every 10,000 years, or so they say. So what are the real odds? If enough people ask, the Casa Blanca Resort and Casino in Mesquite might make book on that question. I now remember my father’s sage advice, which was, “Never build anything in a flood plain”. Although it lies only ninety miles from Las Vegas, Mesquite has closer ties to St. George, Utah, forty miles north on I-15. In the nineteenth and early twentieth centuries, both Las Vegas and Mesquite were Mormon settlements. They were among a string of towns that grew up along the Old Spanish Trail, leading to Los Angeles. A common denominator among Mormon settlers and their current day counterparts is industriousness. If there is a potential for land development, the business community in Mesquite will soon take advantage of it. 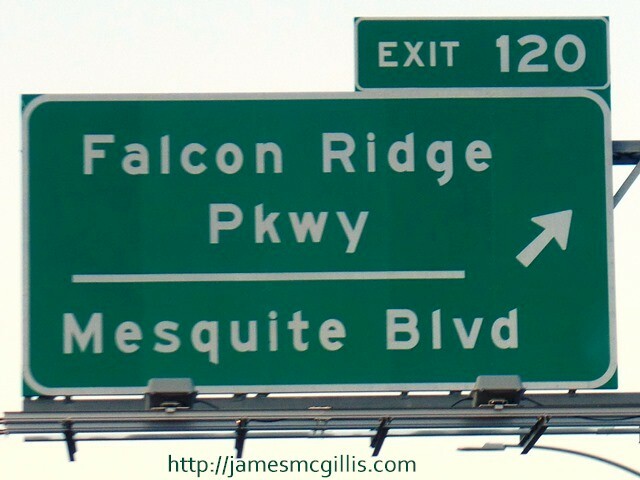 The years 2008 and 2009 represented the depths of the recent recession in Mesquite. Since then, there has been a steady, if slow economic recovery. New condominiums and businesses now present themselves, but current economic activity does not approach the breakneck pace of the early 2000’s. Now enthralled again by new development potential, protection of Mesquite’s historical buildings, signage and its highway heritage languish. 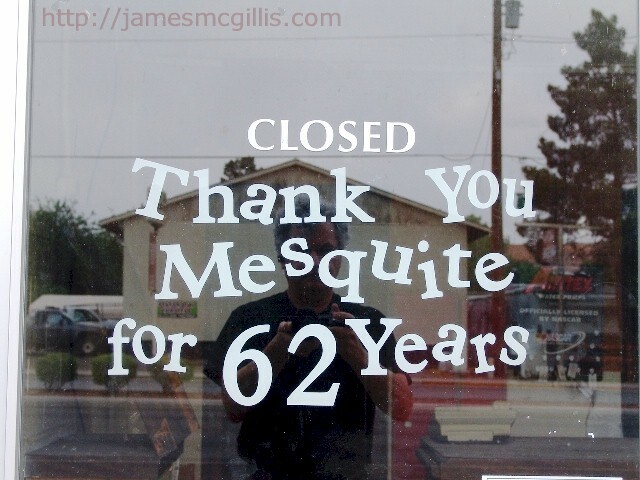 To be fair, most destruction or neglect of historical buildings and signage in Mesquite happens on private property. Even so, it appears that neither the city nor its business community sees value in saving the town’s historical qualities. For posterity, I shall document three examples of Old Mesquite at its finest. 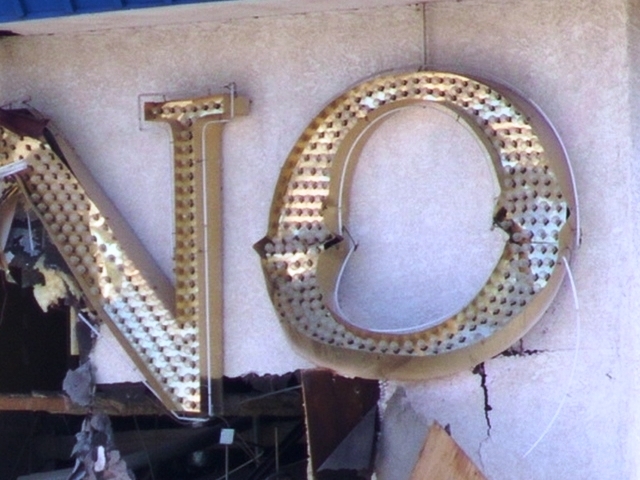 In 2013, the long defunct Oasis Hotel Casino and Resort disappeared from West Mesquite Boulevard. 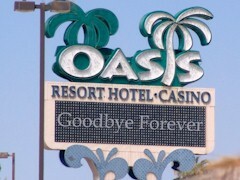 Around that time, the historical Oasis pole sign disappeared from its prior location near Interstate I-15. New visitors to Mesquite will never know that there once stood the biggest, fanciest and most successful casino resort in town. 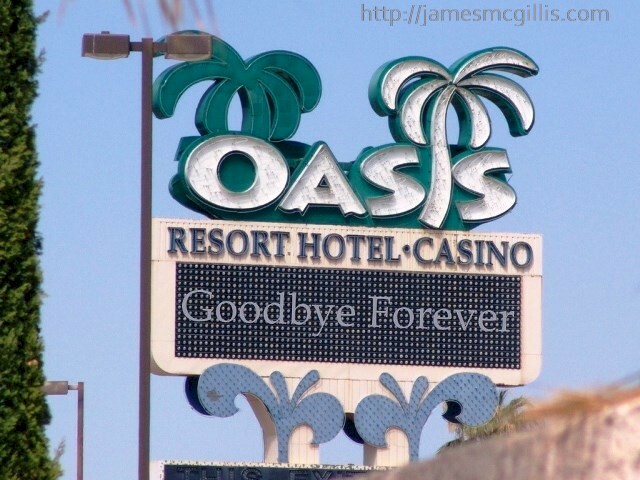 Other than an aging RV Park now operated by the Casa Blanca Resort Casino and an annex of hotel rooms now converted to timeshares, the Oasis is no more. Farther east on West Mesquite Blvd. is what remains of Harley’s Garage. In 2009, a sign on the locked front door thanked customers for Harley’s sixty-two years in business. From Harley's graphical pole sign, which almost overhangs the highway; we know that Harley’s Garage once sold radiators and specialized in Ford automobiles. 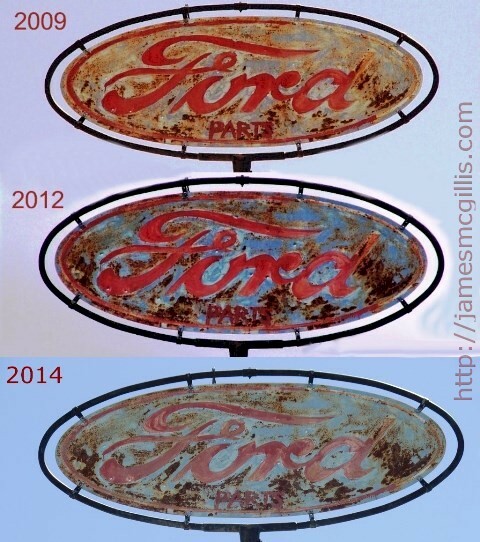 The aging Ford sign, which resides just above an image of a Ford Model-T style radiator, now turns to rust and eventually to dust. The classic “Ford” script, once painted brilliant red on blue, now appears as rust-red on pale blue. At its present rate of decay, full deterioration is only a few years away. I picture travelers on old U.S. Highway 91 in 1945, experiencing a breakdown near Mesquite, Nevada. No matter how the motorist arrived in Mesquite, Harley’s Garage was ready to replace or repair overstressed radiators, batteries or brakes. Now-outdated internet business listings indicate that Harley's once had a AAA towing franchise. 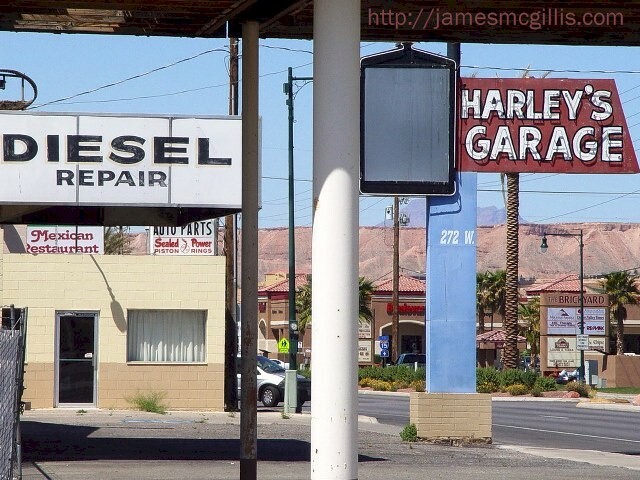 With Las Vegas and St. George scores of miles away across a desert wasteland, we can imagine what a godsend Harley’s Garage and radiator repair shop must have been. Historically, Mesquite was a ranching and farming community. Despite two historic floods that destroyed the economic vitality of Old Mesquite, several generations of Mesquiters continued to grow crops in the floodplain of the Virgin River. For their part, ranchers in nearby Bunkerville grazed their cattle on a once verdant, open range. Since Old Mesquite’s settlers banded together for sustenance and protection, they required a place to buy, sell and trade their produce and cattle. On West Mesquite Blvd. stands a contemporary Ranch Market building. Despite looking relatively new and prosperous, by 2009 the Ranch Market stood closed for good. Looking inside, I could see display cases and shopping carts gathering dust behind the glass. Out back, on the same over-sized lot was an old pole barn, weathering and deteriorating in the sun. Later, I learned that the pole barn had once been the original Mesquite Ranch Market. 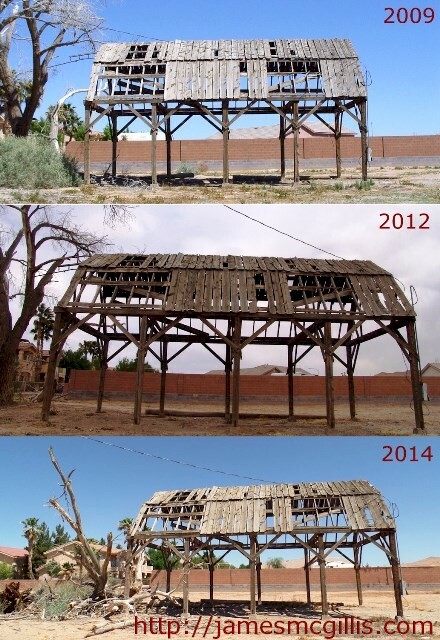 With a few rough sawn boards still clinging to the its roof, I tried to determine the age of the barn. “The better part of a century”, I thought. A long abandoned electrical service clung to one of its corners. There were broken remnants of an overhead trolley, which once moved hay bales in and out of a now missing hayloft. With no remaining siding, doors, roof shingles or hayloft, only the cross-bracing of its beams keeps the pole barn from its inevitable destruction. In the past five years, an adjacent and a once mighty cottonwood tree has crumbled closer to the ground. With such rapid deterioration, how much longer the original Mesquite Ranch Market will stand is anyone's guess. The desert environment, with its heat, sun and wind can destroy almost any human made object. Repainting and replacement are constant activities for thriving businesses in a desert economy. Keep it neat, keep it clean and tourists will stop. Let it go and the desert will soon remove the gloss of civilization. There stands North Mesquite, gleaming in the reflected light of its mini-lakes and golf courses. On the other side of town, more often than not, the desert is winning its inevitable, entropic race. It is here that I say, so long to Old Mesquite. It was good to know you.